We made it. THE KNIGHTMARES will be officially published in exactly 1 week. To say I am excited is an understatement. To have an audience to entertain with the stories in my head has been a dream of mine for a long time. This is just the first step of many. HOWEVER - I need all of you to do something for me first. Earlier today, you should have received an email asking if the address on file at Inkshares is the correct address. Please check that address, and if it is incorrect, please log into Inkshares and make those changes. This is something that will be especially important if you have moved since 2016. Go to the upper right corner, there will be a circle. Click that circle. The sixth item under that circle will say Shipping Address. Select Shipping Address. I want each and every one of you who bought my book to receive it; you helped to get The Knightmares published, you deserve to have your copy delivered without problem. Again, thank you, and enjoy! Tell everyone you know about the book! Make sure to leave a review on Amazon, Barnes and Noble, and Goodreads. AND STAY TUNED FOR MORE AS I ANNOUNCE MY NEXT PROJECT SOON! The Knightmares has officially begun production! Mark your calendars for October 16th! IMPORTANT: If you have moved since preordering a book, please log into your Inkshares account and update your address! Otherwise, you will not receive your book! The editing process has been going smoothly, and I feel it has helped make the book an overall better product. It has allowed me to take a step away and reevaluate what I want this story to be. The product you will receive is the best version of this story I have to offer, and I am excited, terrified, anxious, and relieved to get it out to its audience. It has been a while, but that’s because I have good news! The Knightmares manuscript has been trimmed down to a lean 134,000 words, and has had changes made that I feel improve the story dramatically. The manuscript has been turned into the team at Inkshares, and I now await my turn to move into the actual editing process, which I don’t anticipate being too long of a wait. I have put in over 200 hours of work into this project since early September, and am excited to finally get this out into the world so I can concentrate on everything from my next story, the long anticipated book of short stories called Grace Falls and my next full length novel, Vexed, as well as marketing and promotion for The Knightmares. Check out this beauty, eh? I am long overdue for an update. Forgive me, because I have news. The Knightmares will be starting the production process soon! I have been contacted by the powers-that-be and things are moving forward. HOWEVER, in order to proceed, I need to cut the word count of my manuscript. The amount of words I need to cut will be quite an ordeal. At first I viewed this as a setback, but as I began combing through the material once again, I see this as a positive. Stepping away from the project for the last year has given me new perspective, not just on my writing, but an overall way to cut information that was no longer useful. This should allow The Knightmares to become leaner, and move at a quicker pace. I cannot promise when I will be able to finish these edits, but I am doing my best considering how long everyone has waited. I have time I can take from my job to work on it, and I will do everything in my power to get it out quickly. During this process, I will reveal the new cover design, which has a few small edits needed. It is a powerful cover, and I’m sure everyone will like it as much as I do. Until the next time, thank you for your patience and your enduring faith in the project. Big things are coming. How’s your summer going? Has the heat gotten to you yet? I’m ready for fall. It can’t come soon enough. I don’t have much to update you with on the publishing front, other than I am still waiting my turn. There were quite a few projects that finished their funding period right around the same time as I, and it’s now a matter of waiting. I’m sure many of you are restless about your investment, but please understand that I am much more restless than any of you. I do not profit from any of my hard work until the book hits the metaphorical shelves, and this has been a project I have been working on since 2001. To help ease your wait, I have been posting free content to hold you over. Please enjoy the next installment of my SCALES - Mythology series! 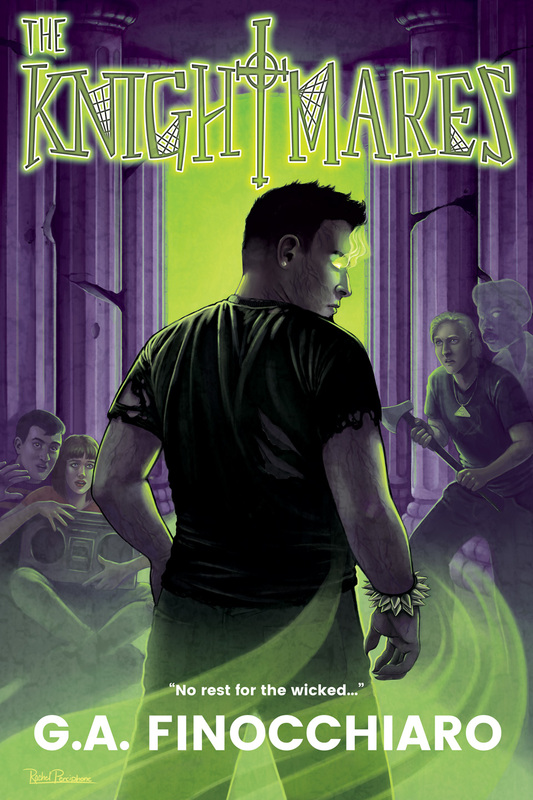 Are you one of those people who are reading this and still haven’t picked up a copy of THE KNIGHTMARES? If so, buy now and get in on the action the moment it is released into the wild. Buy now, here! SCALES - MYTHOLOGY - THE FIRST FALL! The first installment of the second chapter in my Mythology series is live on my site! Check it out here! Other Updates - GRACE FALLS! My anthology series, GRACE FALLS, is almost done its first draft. So far I am happy with how it’s turning out, with nods to favorite episodes of Tales from the Crypt, Amazing Stories, and more. Short stories can be a lot of fun to read and write, and I am happy to say that the stories I am writing for the anthology are a joy for me on both fronts. Want to know a little about what’s in the anthology? Mum - Three best friends in the summer of 1987, cross paths with a serial killer that may just be something even more disturbing. Breacher - Little Amanda has a grand imagination, but whatever crashed in her backyard in the middle of the night was not a part of it. In fact, it may not even be of this world. Pajamas - Pajamas is a loyal dog, caring as much for his human family as they do for him, but there’s something fishy about one of the other family pets. It smells funny and makes strange noises unlike anything Pajamas has ever heard before. Cubicle 43-B - Jonah can’t stand his job, but today, on his birthday, his job will push him to the edge. Mr. Hallows - Dylan has big dreams of being a rock god, but his math teacher, Mr. Hallows, is an awful curmudgeon who has made it his mission to ruin Dylan’s chill. However, there’s much more to Mr. Hallows than meets the eye, and when Dylan is forced into a dare, he must traverse the dark depths of Mr. Hallows’ personal life by breaking into his home. The Extraordinary Girl - When evil lurks on playgrounds, little children beware. However, some children are not as helpless as others. Catch the anthology in its finished form sometime this fall/early winter! If you’re looking to be a beta reader, please reach out to me, I could use the extra help! Tell your friends and stay connected! And explore my website for blog posts, updates, artwork, free content, and more! It’s that time again! How are you? Are you hanging tight? Enjoying the summer? I hope so. Here is your monthly update on the many comings and goings and random things that I have been up to. I have been busy! Read on for updates! There are rumblings of movement in the publishing queue. As I have no real knowledge where in the queue I am, I do know that things are moving along, and that I hope to hear something before the end of the Summer. Thank you all for sticking by me, as this delay has been beyond my control. I promise to update you ASAP, as well as meeting all my promises for those who qualified for T-shirts, posters, and more! Nothing has been forgotten. Bear with me as I move forward on this venture. IF YOU HAVE MOVED ADDRESSES and ordered a physical copy of the book, please log into INKSHARES and update your address! I do not want copies of the book being lost in the mail when they finally do ship. Haven’t yet bought THE KNIGHTMARES? Grab a copy now! Currently the #2 seller in HORROR on INKSHARES! Have you been keeping up on the FREE content I’ve been writing for YOU on my site? If so, the final part of SCALES - GENESIS has been posted for the month of June! Check it out here! If not, WHAT ARE YOU WAITING FOR! Check it out from the beginning, starting here! What is SCALES? SCALES is the backbone of all my written works. Each short story, every novel, will all be connected. People and places, objects and outcomes, all will bleed from story to story. MYTHOLOGY is where it starts. Check it out! I will be continuing to release a new chapter in the MYTHOLOGY every month. July will start the next series as GENESIS ends, called THE FIRST FALL. Keep an eye out for that next month! As many of you know, I have been working hard on a short story called MUM. The second draft has been finished, and I will be working on the third draft soon, tightening up a few things, and getting it ready for publishing. Weighing in at 20K words, it is quite an epic short story. Short stories are excellent ways to create new content, try out new ideas, and set up larger themes throughout my writing and throughout the SCALES universe. MUM was so fun to write, that I have decided to write additional short stories and collect them all into an anthology I will be releasing that anthology next year called GRACE FALLS. GRACE FALLS will include seven short stories (subject to change) that dive further into the universe, expanding on SCALES, and furthering backstories for THE KNIGHTMARES, VEXED, and others. Here is a list of the short story titles to leave you curious. It’s that time again! At the end of every month I have sworn to not only update you on progress, but to send you FREE content! The FREE content has been written to give you a more immersive experience, a deeper dive into the world I have created in The Knightmares. So without further adieu, check out SCALES - GENESIS part IV! For those who have been keeping up with the story, please feel free to share your thoughts and connect with me. I’d love to hear your thoughts and discuss! For new comers - My SCALES mythology goes back to the beginning of time, and sets up conflicts and folklore that perpetuates through The Knightmares and the series as a whole. I will release 1 to 2 parts at the end of every month until THE KNIGHTMARES is published. A few weeks ago I was asked to submit my manuscript. I did not haste, did not pass go or collect $200 (I think Monopoly needs to update with modern inflation standards), I turned my manuscript in as soon as possible and have been waiting on pins and needles ever since. Once I hear back, YOU ALL, my faithful backers, will know. Mum has been progressing quite well, and I should finish up a first draft TODAY. I went over my max word-count, but am hoping for some editing help, as well as some leniency. Overall, I managed to create a story that hit all the inspirations I was looking for. I think it is turning out quite well, and am looking forward to getting it out into the world soon! BLOG - For blog posts and information about my projects, check out my website! FACEBOOK - For updates and announcements, connect with me on facebook! This is my monthly check in to say hey, give you my perpetual thanks, to entice those who have not purchased a book to do so, and to share with you some free content! I am still waiting in the queue to begin publication, but there are rumblings that things are moving along and that I will be taking part soon. As soon as I hear something, all of you will know! In the meantime, if you’re still on the fence about THE KNIGHTMARES, now is the time to grab yourself a copy for you, for your friends, for your significant other, for your dog and your cat! Grab one today. The Knightmares is ranked #2 on INKSHARES in Horror. Let’s give it a push! FREE CONTENT! FREE CONTENT! FREE CONTENT! As a promise to you all, I have continued my monthly serial called MYTHOLOGY, and I present to you not just one part, but two! Check it out! Make sure to read part I if you haven’t already! Check out parts II and III here. The Mythology will not only build a larger universe, but it will set the stage for The Knightmares, and other projects I am working on. Second order of business! I have decided to have my cover artist, the very talented Rachel Perciphone, design a SECOND cover. Once both of these are wrapped up, I will present them to you to choose which is best with some extra incentives. Check out her work! She’s awesome! Lastly, I leave you with a teaser image from my upcoming short story, MUM. As promised on my Facebook page and in my last update, I have a few things I want to share with you all. It has been quite an eventful month of March, which I have found myself as busy as I have ever been. Why is that, you ask? Let me count the ways! 2) ...check out SCALES - One of the many things I have been pondering was how to keep my backers, and potential backers, engaged during this time as I wait my turn to start working on the publication process. What I came up with is SCALES - MYTHOLOGY. What is that, you ask? As I’ve mentioned before, my books will all take place in a shared universe. That universe has a unique beginning that sets the stage for the events that take place in THE KNIGHTMARES and others. With my love of mythology, I decided to write my own. So I present to you, SCALES - GENESIS, part one of a monthly series of installments that will tell the tale of the world, how it came to be, and the many creatures and realms that exist there. Please read and let me know what you think. "SCALES has a deep mythology spanning from the beginning of the Third Dimension, to present day. Readers familiar with Greek, Egyptian, Roman, Norse, and Christian mythologies will all see something familiar, as well as a generous helping of Lovecraftian mythos." The Mythology will be broken down into eight parts, each with multiple installments. Stay with me! More to come! 3) MUM - A few weeks ago I was asked to join a collective of other authors interested in publishing a short story anthology. Luckily, I have had an idea for a short story for quite some time and have been searching for an opportunity to use it. Though I wasn’t necessarily prepared to start writing something other than VEXED, my next novel, I decided this was an opportunity too good to pass up. Coming this fall, my 10,000 word short story will be called "Mum"
MUM is story somewhere between Stephen King’s famous short story, "The Body" and the movie "Kiss The Girls." It takes place in the fictional town of Grace Falls, where three teenage boys find themselves in the path of a serial killer in the summer of 1986. 3) VEXED - My second novel is still in the works, and has obviously taken a back burner to the previously mentioned projects, but that doesn’t mean it is not actively on my mind. I have 5 pages of notes for changes and ideas on how to improve the manuscript. Stay tuned on updates for Vexed in the months to come! That’s all for now! Check out SCALES - GENESIS, and keep an eye out for MUM sometime this fall with updates coming soon! It’s been a while, and there’s a very good reason for that. For one, I am balancing a career and my writing as best I can, which is not always a winning battle. In addition to that, I really don’t have much to update everyone with, as I am waiting my turn like everyone else. Inkshares has a ton of books all in the same queue, and we will be notified by the publisher when our time comes. As soon as I hear something, I will make an announcement. Starting on April 1st (no fooling) I will be releasing BRAND NEW FREE content on the first of every month leading up to The Knightmares release. This content will be available on my new author site that will be launching in a few weeks. Not only am I writing Vexed, but I have been squeezing every available moment I can into writing this content, creating a new webpage, and also creating artwork as well, ALL FOR YOU! The free content includes a mythology that introduces everyone to an interconnected world I call SCALES. Borrowed from my love of Greek, Egyptian, Norse, and Mesopotamian mythology and folklore, this mythology will start at the beginning, and set up the stage for epic level world events that will be the stage of each of my novels. There will be a few surprises for those who enjoy classic Lovecraftian horror, which I hope does not disappoint. I will be sending out an official email across all channels when the content and the site are ready. Hopefully this will keep your appetite roaring for when the book goes into official production. Thanks again everyone, for your support!